Save money on Christmas decorations by creating beautiful paper Christmas decor, including these fun paper Christmas ornaments. Today is Day 1 of a fun series. 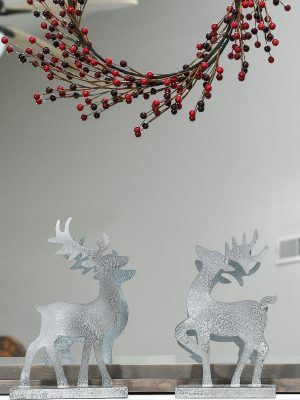 Over the next 7 days, I will be sharing a new post each day with a creative way to decorate for Christmas with paper! Because we all know that decorating can be expensive, so let’s save some money this year and make paper Christmas decor instead. Get excited for tutorials and printable templates for paper Christmas ornaments, paper Christmas trees, printable Christmas art, paper cookie boxes, and more (like these 19 Amazing Paper Christmas Decor Ideas)! I am slightly obsessed with these adorable paper gingerbread houses. The idea for these came to me when I was dreaming up my theme for this year’s Christmas tree. 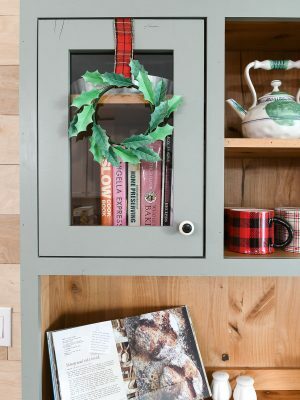 I wanted to go old-fashioned, including hanging gingerbread cookies. But then I thought how cute would it be to hang little gingerbread houses on the tree. Adorable? Yes. Practical? No. There was no way I was going to be making a bunch of tiny gingerbread houses. Let alone assembling and decorating them. So I decided to make some out of paper instead! Then from there the ideas just poured in. 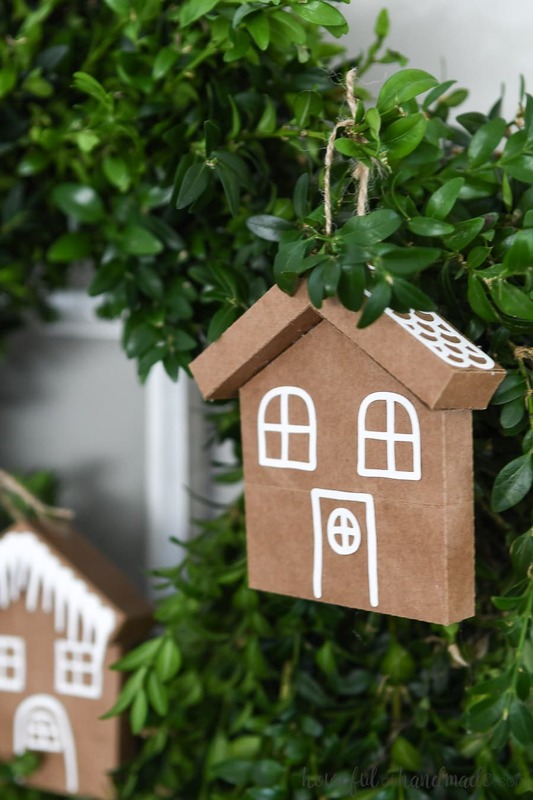 It was like these adorable paper gingerbread house ornaments were speaking to me! Instead of running to the store to buy brown cardstock, I realized I could make them out of something I already had a lot of in the house. Something that was free. 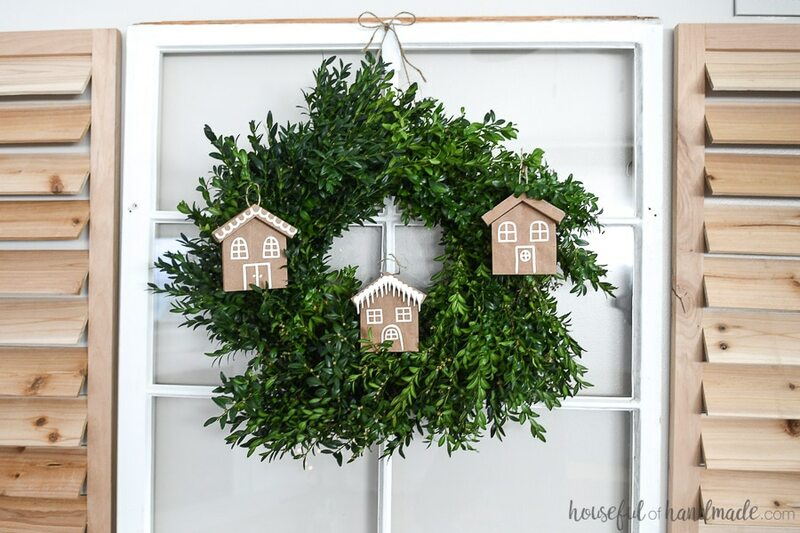 Something that I could upcycle into the best Christmas ornaments ever…. 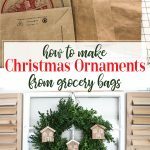 Yep, these amazing paper Christmas ornaments are made out of a brown grocery bag. I was able to cut out 6 gingerbread houses out of 1 paper bag too. 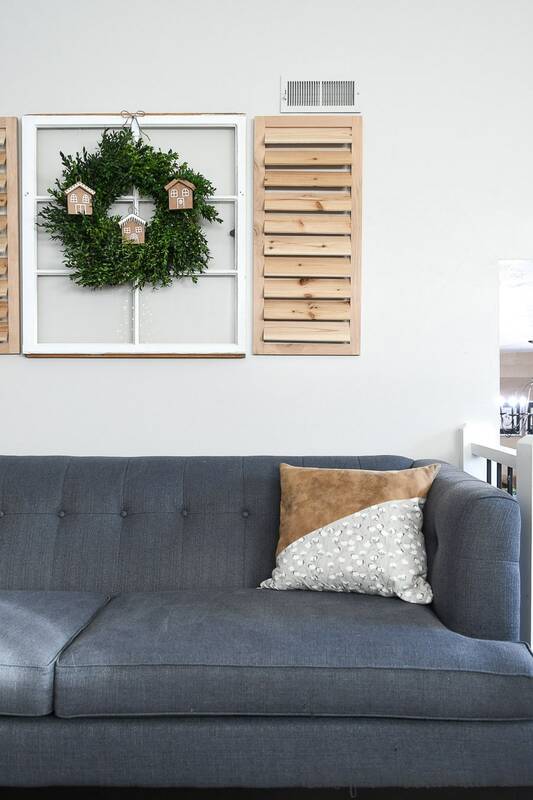 How’s that for decorating for Christmas on a budget? 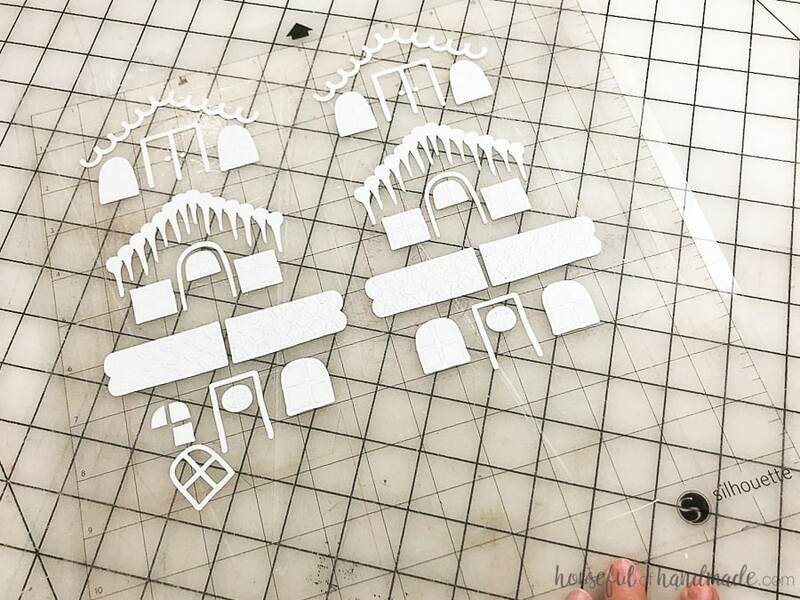 I did use my Silhouette Cameo to easily cut out all my houses, but don’t worry if you don’t have one. I have also included a PDF template of the gingerbread house ornaments that can be printed on a piece of paper bag. Just cut it to 8 1/2″ x 11″ before putting it in your printer. Easy as that! And if you don’t have a Silhouette Cameo yet, you can always ask the big man to bring you one for Christmas. Especially if you love creating amazing paper decor that no one will guess is made out of paper (like this Anthropologie knock-off mirror or this faux wood snowflake). The cut files & PDF for these paper Christmas ornaments were free to my subscribers until 11/25/2018. Now they are available to purchase in the shop. Make sure to subscribe so you will be notified of new freebies! 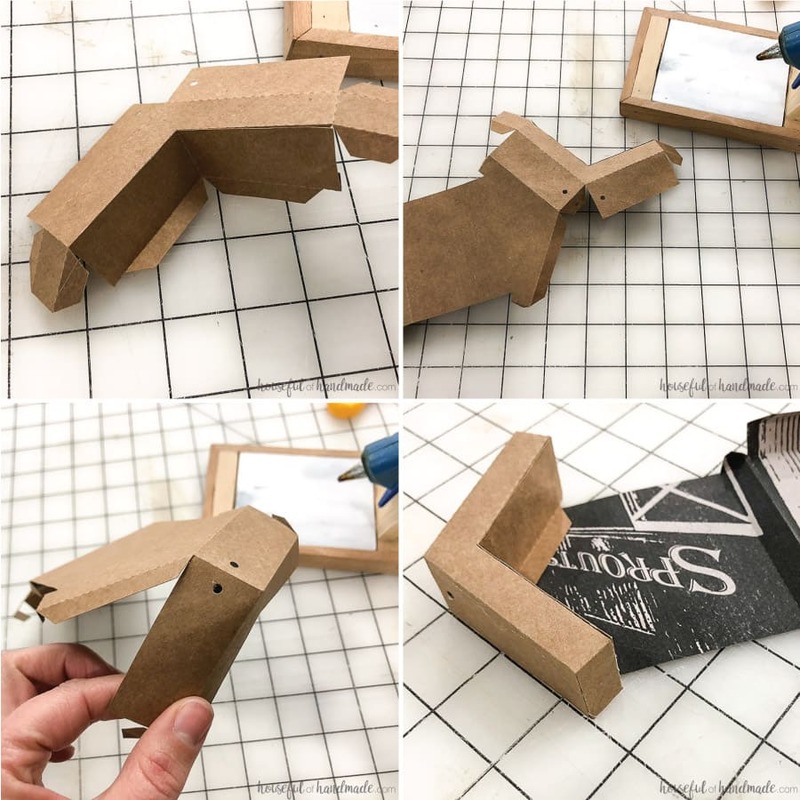 You can also use a glue stick or this awesome paper glue, whatever you prefer. 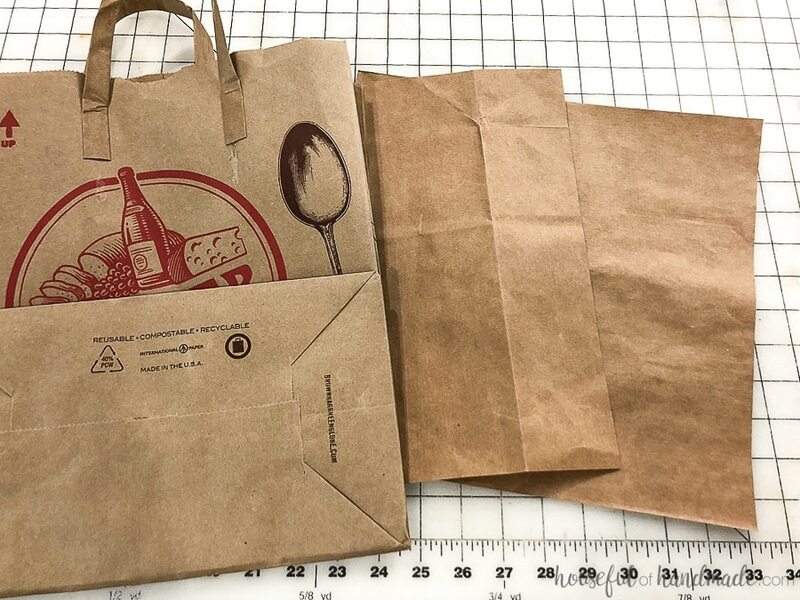 Cut open a paper grocery bag. Start by pulling off the handles, then cut the seam out of the center back. 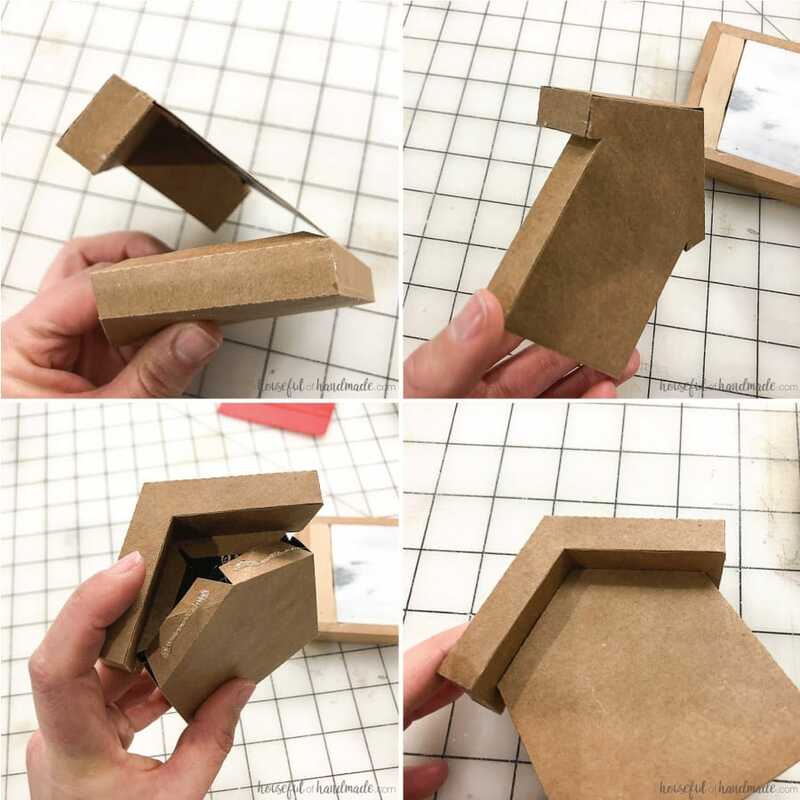 Cut the bottom off and so you are left with a large piece of single layered brown paper. 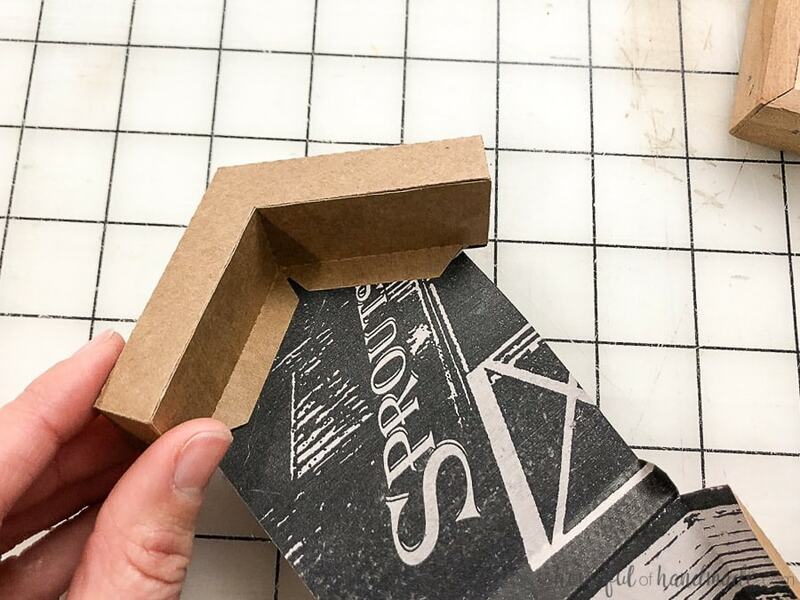 Trim it down to 12 x 12 inch pieces for using with a Silhouette Cameo or 8 1/2 x 11 inch pieces to run through the printer. Smooth out any creases by folding them agains the normal fold. 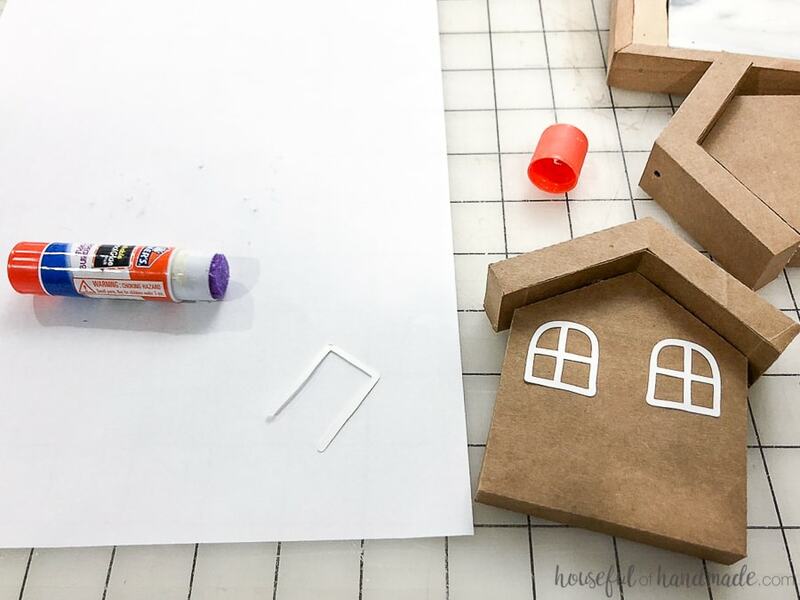 Cut out the 3 pieces on the gingerbread house template from the brown paper bag per ornament. 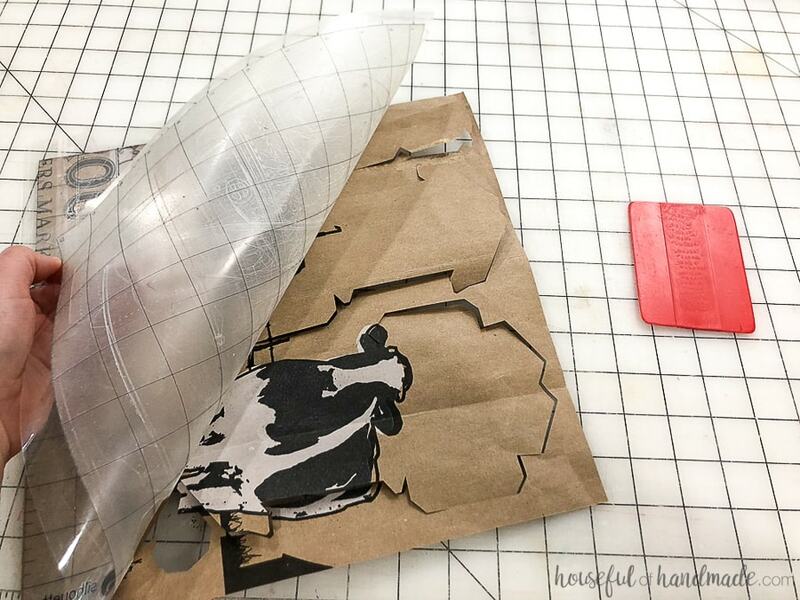 When peeling paper off your Silhouette cutting mat, flip the mat over and pull the mat off the paper to prevent it from curling. Fold the paper ornament pieces along the dotted lines. 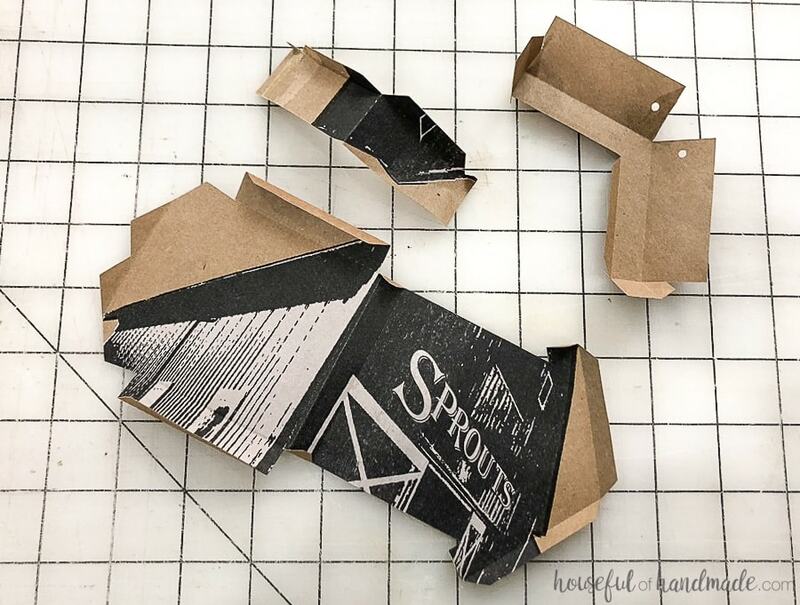 When making decor out of paper, take time to pre-fold all the pieces to get crisp clean folding when assembling. Also, a scoring board is super helpful for getting clean fold lines. Start by folding the roof pieces of the paper gingerbread house. Glue the smallest piece to the front of the medium piece to create the bottom of the roof. Then glue the medium piece to the back of the larger piece to attach the roof. Glue down the side flaps to secure. Glue the flaps on the underside of the roof to the back of the house to secure and stabilize the roof. Glue together the base of the gingerbread house by first gluing the flaps on the bottom to the front. Then secure the flaps on the sides. Finish by adding glue to the flaps under the roof and then laying flat to secure to the underside of the roof to secure. 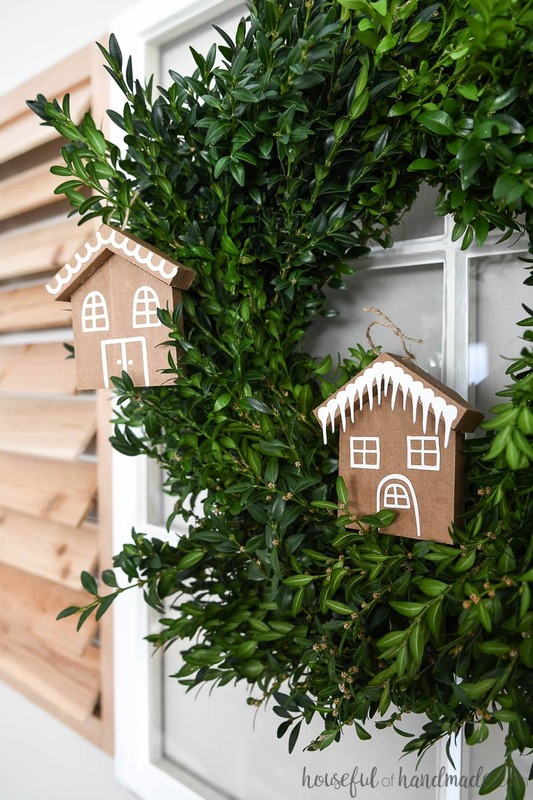 Cut out the gingerbread house decorations out of white cardstock. There are 3 different designs, but feel free to switch things up or make your own decorations. If you don’t have a Silhouette Cameo, you can cut the insides of the decorations with an x-acto knife. Or try drawing on the houses with a paint pen. 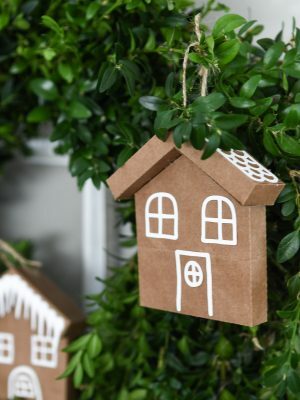 Use a glue stick to attach the decorations to the paper gingerbread house ornaments. Have fun decorating them however you want, just like a real gingerbread house. Thread a piece of twine through the holes in the roof and tie it in a circle. I found the easiest way to get the twine through is by using a needle and thread. Tie a couple inch piece of thread into a circle, then thread the twine through the thread and hold the two ends together as you put the needle through the holes so you can pull the twine through. 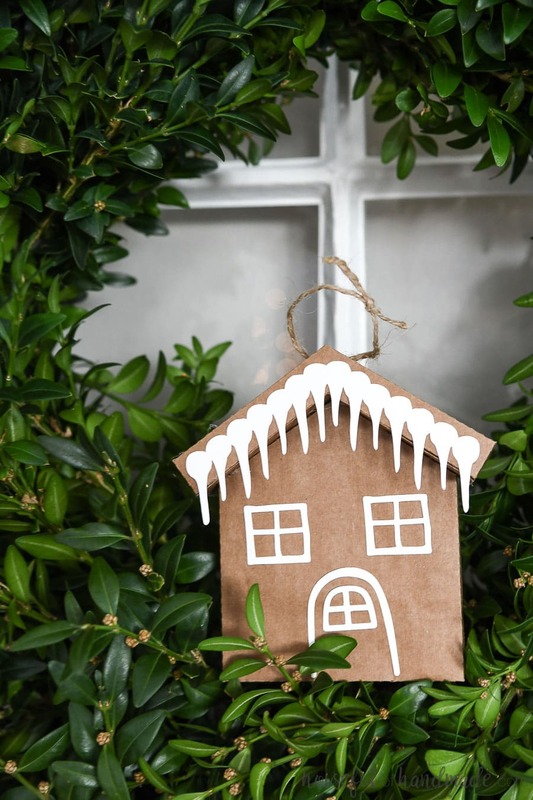 Now all you need to do is hang your new gingerbread house ornaments on your Christmas tree. Then run to the store for some groceries so you can make lots more! I’m still working on my tree so I hung them on my new boxwood wreath (thanks Trader Joes). And now I think I might keep them there! Then come back tomorrow for Day 2 of the 7 Days of Paper Christmas Decor. Here is the plan for the week. You won’t want to miss out on anything! Yay. I’m glad you are excited Sam. It should be lots of good stuff for Christmas! Very busy, but Christmas is so fun it is worth it. Enjoy Teresa! I love these !! Thanks for sharing. Thanks Yuni! I hope you have as much fun with them as I have.